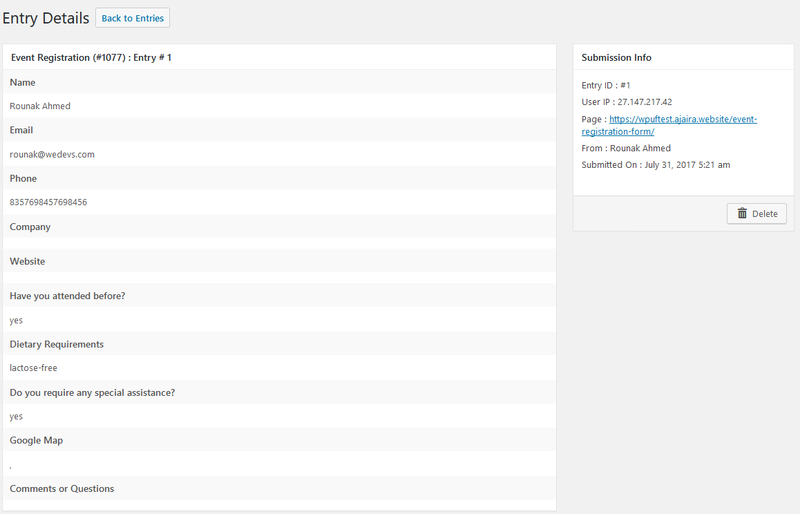 To view responses, go to weForms from your WordPress dashboard. Under Contact Forms you will be able to view all your forms, their entries, views, and conversion. To view responses on a particular form, click on the number of Entries of the relevant form as shown below. The number of total responses for each form is shown under the Entries tab. Alternatively, you can click on View Entries when you hover on a form. You can also see the number of Views this form received. The Conversion category shows any click-throughs that occurred through your form. To view the entire response, click on Details beside each response. Alternatively, you can also view the submissions of each form from WP Dashboard→weForms→Entries. Select the form from the drop-down. Then click on Details beside each entry to start viewing. That's all about viewing entries on weForms!